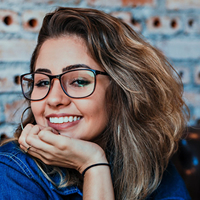 Healthy news and information from Incredible Smiles. A recent study published in the Medical Journal of Australia caught our eye. It sought to determine the proportion of children visited by the Tooth Fairy. The study also attempted to determine the average payment per tooth. The study was conducted in Zürich, Switzerland during the latter part of 2016. Parents of children who had recently lost at least one milk tooth (“baby” teeth) were asked to complete a survey. There was a 35% completion rate among the 3617 parents invited. It revealed a 71% visitation rate by the Tooth Fairy. The average price the Tooth Fairy is ready to pay for a milk tooth in Zürich was AU$9.45, £5.80, US$7.20. That’s more than previous studies. The mother tends to decide how much money the Tooth Fairy pays out. 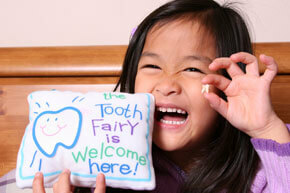 Those who have been monitoring the exchange rate conclude that the Tooth Fairy generally keeps up with inflation. Good to know. Red wine, tea and black coffee are known to stain teeth. But here are some foods that can actually help whiten teeth. 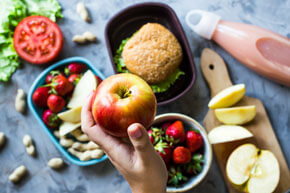 Apples – Bite into an apple and you’re helping to strengthen your gums. Plus, the high water content in apples helps increase the production of saliva. 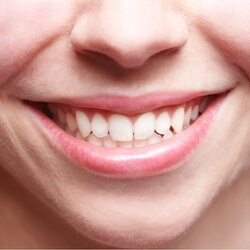 This in turn can help wash away bacteria that can lead to stained teeth. Seeds and Nuts – Sunflower seeds, walnuts and almonds provide important trace minerals. Plus, their abrasive texture helps to remove surface stains. Think of them as an exfoliator for your teeth. Strawberries – The malic acid in strawberries can act as an astringent that can help reduce tooth discolouration. For a refreshing change, mash up a strawberry and use it as toothpaste! Baking Soda – Speaking of toothpaste, try brushing with baking soda. This pantry staple acts like a bleaching agent, scrubbing off plaque and surface stains. What’s the Best Time to Floss? 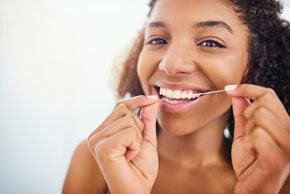 Besides brushing, flossing pays the greatest dividends when it comes to oral hygiene. Is there an ideal time to floss? Yes. Anytime! Today, we know that using an interdental cleaner (like floss) is part of taking care of our teeth and gums. Yet, many of our older patients see flossing as, well, optional. Maybe because it wasn’t until the 1980s that flossing was acknowledged as a helpful self-care procedure. Granted, brushing and flossing after every meal is ideal. But if flossing is going to be a once-a-day habit, consider this guideline. If you’re a “morning person,” floss in the morning. If you’re a “night owl,” floss at night. If you’re not sure, floss before bedtime. That way your mouth will be clean while sleeping. Finally, should you brush first or floss first? It doesn’t seem to matter. However, those who brush first seem more likely to neglect flossing because their mouth feels clean.